The heat index (HI) or humiture is an index that combines air temperature and relative humidity, in shaded areas, to posit a human-perceived equivalent temperature, as how hot it would feel if the humidity were some other value in the shade. The result is also known as the "felt air temperature", "apparent temperature", "real feel" or "feels like". For example, when the temperature is 32 °C (90 °F) with 70% relative humidity, the heat index is 41 °C (106 °F). This heat index temperature has an implied (unstated) humidity of 20%. This is the value of relative humidity for which the heat index number equals the actual air temperature. The human body normally cools itself by perspiration, or sweating. Heat is removed from the body by evaporation of that sweat. However, high relative humidity reduces the evaporation rate. This results in a lower rate of heat removal from the body, hence the sensation of being overheated. This effect is subjective, with different individuals perceiving heat differently for various reasons (such as differences in body shape, metabolic differences, differences in hydration, pregnancy, menopause, effects of drugs and/or drug withdrawal); its measurement has been based on subjective descriptions of how hot subjects feel for a given temperature and humidity. This results in a heat index that relates one combination of temperature and humidity to another. Because the humidity index is based on temperatures in the shade, while people often move across sunny areas, then the heat index can give a much lower temperature than actual conditions of typical outdoor activities. Also, for people exercising or active, at the time, then the heat index could give a temperature lower than the felt conditions. For example, with a temperature in the shade of only 28 °C (82 °F) at 60% relative humidity, then the heat index would seem 29 °C (84 °F), but movement across sunny areas of 39 °C (102 °F), would give a heat index of over 58 °C (136 °F), as more indicative of the oppressive and sweltering heat. Plus when actively working, or not wearing a hat in sunny areas, then the feels-like conditions would seem even hotter. Hence, the heat index could seem unrealistically low, unless resting inactive (idle) in heavily shaded areas. The heat index was developed in 1978 by George Winterling as the "humiture" and was adopted by the US's National Weather Service a year later. It is derived from work carried out by Robert G. Steadman. Like the wind chill index, the heat index contains assumptions about the human body mass and height, clothing, amount of physical activity, thickness of blood, sunlight and ultraviolet radiation exposure, and the wind speed. Significant deviations from these will result in heat index values which do not accurately reflect the perceived temperature. In Canada, the similar humidex (a Canadian innovation introduced in 1965) is used in place of the heat index. While both the humidex and the heat index are calculated using dew point, the humidex uses a dew point of 7 °C (45 °F) as a base, whereas the heat index uses a dew point base of 14 °C (57 °F). Further, the heat index uses heat balance equations which account for many variables other than vapor pressure, which is used exclusively in the humidex calculation. A joint committee[who?] formed by the United States and Canada to resolve differences has since been disbanded. The heat index is referenced to any combination of air temperature and humidity where the partial pressure of water vapor is equal to a baseline value of 1.6 kilopascals [kPa] (0.23 psi). For example, this corresponds to an air temperature of 25 °C (77 °F) and relative humidity of 50% in the sea-level psychrometric chart. At standard atmospheric pressure (101.325 kPa), this baseline also corresponds to a dew point of 14 °C (57 °F) and a mixing ratio of 0.01 (10 g of water vapor per kilogram of dry air). A given value of relative humidity causes larger increases in the heat index at higher temperatures. For example, at approximately 27 °C (81 °F), the heat index will agree with the actual temperature if the relative humidity is 45%, but at 43 °C (109 °F), any relative-humidity reading above 18% will make the heat index higher than 43 °C. It has been suggested that the equation described is valid only if the temperature is 27 °C (81 °F) or more, and the relative humidity is 40% or more. However, a recent analysis by iWeatherNet found the assumption to be erroneous given that the heat index/relative humidity relationship and the corresponding equilibrium temperature (the point at which the air temperature and the heat index are equal) are nonlinear. The heat index and humidex figures are based on temperature measurements taken in the shade and not the sun, so extra care must be taken while in the sun. The heat index also does not factor in the effects of wind, which lowers the apparent temperature, unless the air is above body temperature. Sometimes the heat index and the wind chill are denoted collectively by the single term apparent temperature, "relative outdoor temperature", or "feels like". Outdoors in open conditions, as the relative humidity increases, first haze and ultimately a thicker cloud cover develops, reducing the amount of direct sunlight reaching the surface. Thus, there is an inverse relationship between maximum potential temperature and maximum potential relative humidity. Because of this factor, it was once believed that the highest heat index reading actually attainable anywhere on Earth was approximately 71 °C (160 °F). However, in Dhahran, Saudi Arabia on July 8, 2003, the dew point was 35 °C (95 °F) while the temperature was 42 °C (108 °F), resulting in a heat index of 78 °C (172 °F). The table below is from the U.S. National Oceanic and Atmospheric Administration. The columns begin at 80 °F (27 °C), but there is also a heat index effect at 79 °F (26 °C) and similar temperatures when there is high humidity. For example, if the air temperature is 96 °F (36 °C) and the relative humidity is 65%, the heat index is 121 °F / 49 °C. 27–32 °C 80–90 °F Caution: fatigue is possible with prolonged exposure and activity. Continuing activity could result in heat cramps. 32–41 °C 90–105 °F Extreme caution: heat cramps and heat exhaustion are possible. Continuing activity could result in heat stroke. 41–54 °C 105–130 °F Danger: heat cramps and heat exhaustion are likely; heat stroke is probable with continued activity. over 54 °C over 130 °F Extreme danger: heat stroke is imminent. Exposure to full sunshine can increase heat index values by up to 8 °C (14 °F). There are many formulae devised to approximate the original tables by Steadman. Anderson et al (2013), NWS (2011), Jonson and Long (2004), and Schoen (2005) have lesser residuals in this order. The former two are a set of polynomials, but the third one is by a single formula with exponential functions. The formula below approximates the heat index in degrees Fahrenheit, to within ±1.3 °F (0.7 °C). It is the result of a multivariate fit (temperature equal to or greater than 80 °F (27 °C) and relative humidity equal to or greater than 40%) to a model of the human body. This equation reproduces the above NOAA National Weather Service table (except the values at 90 °F (32 °C) & 45%/70% relative humidity vary unrounded by less than ±1, respectively). For example, using this last formula, with temperature 90 °F (32 °C) and relative humidity (RH) of 85%, the result would be: Heat index for 90 °F, RH 85% = 114.9. ^ a b c Steadman, R. G. (July 1979). "The Assessment of Sultriness. Part I: A Temperature-Humidity Index Based on Human Physiology and Clothing Science". Journal of Applied Meteorology. 18 (7): 861–873. Bibcode:1979JApMe..18..861S. doi:10.1175/1520-0450(1979)018<0861:TAOSPI>2.0.CO;2. ^ Steadman, R. G. (July 1979). "The Assessment of Sultriness. 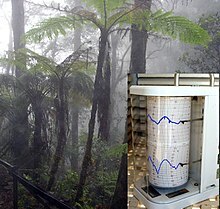 Part II: Effects of Wind, Extra Radiation and Barometric Pressure on Apparent Temperature". Journal of Applied Meteorology. 18 (7): 874–885. Bibcode:1979JApMe..18..874S. doi:10.1175/1520-0450(1979)018<0874:TAOSPI>2.0.CO;2. ^ "Spring and Summer Hazards". Environment and Climate Changes. Government of Canada. Retrieved 2016-09-22. ^ Heat Index Campbell Scientific Inc. Archived 2010-05-25 at the Wayback Machine (PDF file), CampbellSci.com. ^ "This Saudi city could soon face unprecedented and unlivable heat levels". Business Insider. Retrieved 2017-07-20. ^ Heat Index on the website of the Pueblo, CO United States National Weather Service. ^ Anderson, G. Brooke; Bell, Michelle L.; Peng, Roger D. (2013). "Methods to Calculate the Heat Index as an Exposure Metric in Environmental Health Research". Environmental Health Perspectives. 121 (10): 1111–1119. doi:10.1289/ehp.1206273. PMC 3801457. PMID 23934704. ^ Stull, Richard (2000). Meteorology for Scientists and Engineers, Second Edition. Brooks/Cole. p. 60. ISBN 9780534372149.